E-BOOK ONLY .99 CENTS: VISIT AMAZON TO GET OUR DESSERT RECIPE COOKBOOK!! PLEASE SHARE YOUR THOUGHTS ON AMAZON AND JOIN US ON FACEBOOK! Barbecue sauce recipes are delicious and versatile. Just a few changes to the ingredients or a longer simmering time and you have a completely new sauce. There is a bbq sauce for everyone out there whether you like it hot or mild, sweet or tangy, vinegar based or ketchup based. 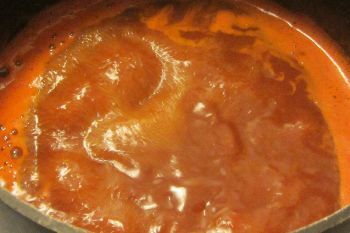 I had a few bbq sauce recipes that I really loved, however at the time I was using ingredients that I have had to eliminate from my diet due to some common food allergies. Some ingredients included, Worcestershire sauce, soy sauce, and garlic, (I am working on a homemade version of Worcestershire and Soy Sauce), I have found that a combination of white vinegar and salt seems to satisfy for soy sauce. Luckily I am still able to use vinegar and ketchup as a base for bbq sauce. Now that the above ingredients have been eliminated from my allergy free recipes I am working on searching for and creating other tasty combinations. I love making bbq sauce recipes for chicken wings, ribs, pulled pork, and of course barbecued chicken. These are a few foods that I am glad that I can still enjoy while avoiding my food allergies. Of course I have been making adjustments to some of the popular side dishes such as potato salad, as I cannot use mayonnaise. Place all ingredients into a saucepan. Stir occasionally with a whisk on medium high heat to bring contents to a boil, allow to boil for a few minutes. Turn the heat down to low and allow simmering for 30-40 minutes, stirring occasionally. Note: I find that the longer you simmer the more the flavor comes out. I suggest simmering for at least 30 mins but if you have time, up to two hours would be good. Return From Barbecue Sauce Recipes to Food Allergies Home Page! Please Like us on Facebook and Share With Your Friends! © Copyright FoodAllergiesRecipeBox.com The information presented here is not intended to replace the advice of your doctor. For diagnosis, treatment or other medical advice, consult a physician or other health care provider.